Kaeden Mann is the son of James and Rhoda Mann. 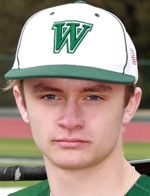 Kaeden is currently in his sophomore year of High School, and has been playing baseball since kindergarten. In addition to baseball, Kaeden is also a member of the Hornet Soccer team. Big 6th inning powers Hornets past Rams. Hornets outscore Black Knights 9-1 for 4th win. Hornets rally to top Mansfield, 16-10. Hornets fall to Troy, 9-5. Hornets survive Canton rally in 16-9 win. Prough named All-Region Player of the Year. Mann named Daily Review Newcomer of the Year. Hornets edge Southern Columbia, 8-6 to advance to D4 AA championship game. Hornets edged out by Danville, 5-4. Hornets top NEB 11-1 in 5 innings. Hornets complete season sweep of North Penn-Mansfield. Hornets shutout Troy 14-0 in 5 innings. Hornets use big second inning to 10-run Williamson. Hornets shutout Sugar Valley, 9-0. Hornets over power Towanda to improve to 4-1. JV Hornets rally for 6-2 win over Canton. Prough headlines All-Region baseball team.